New England wineries produce an eclectic array of vintages, from coastal Chardonnays to the apple and blueberry wines of Maine, from ice wines to red wine infused with chocolate. Even better, many of the region's vineyards welcome visitors to not only taste their wine selections but to view and learn more about the wine-making process. And, as the number of wineries in New England has grown, the competitive environment has inspired new offerings at these picturesque destinations: Everything from concert series to art exhibitions to special dining events. Whether you're looking to visit one winery while you're in New England or to plan an entire itinerary around "vineyard hopping," this guide will point you to places to visit in all six New England states. You're least likely to find wineries open during the winter months, though many stay open year round. The fall foliage season is a splendid time of year to plan a winery-themed tour of one or more New England states. Here's a quick look at must-visit New England wineries, state-by-state, featuring some of our personal favorites. Lost Acres Vineyard in North Granby, CT, which hosts revolving art exhibitions and special events like farmers markets and musical performances. Arrigoni Winery in Portland, CT, which--in addition to whites and reds--offers specialty wines like Chocolate Love, Smashed Pumpkin (made with real pumpkin) and Sugar House (infused with maple syrup). Sharpe Hill Vineyard, which is worth the drive to Pomfret, CT, to taste award-winning wines and to savor a meal at one of New England's best places to dine fireside. Cellardoor in Lincolnville, ME, where you won't want to miss Treasure: A dessert wine made with wild Maine blueberries and local maple syrup. Blue Current Brewery in Kittery, ME, which is a fledgling operation and the first in the state making Japanese sake (rice wine). Furnace Brook Winery in the Berkshires in Richmond, MA, where you can pair wines with cider donuts since this is also home to Hilltop Orchards. Nashoba Valley Winery in Bolton, MA, which is a lovely destination for picking your own peaches, nectarines, and apples in season, too, and home to J's Restaurant, which serves farm-to-table fare and the vineyard's wines. 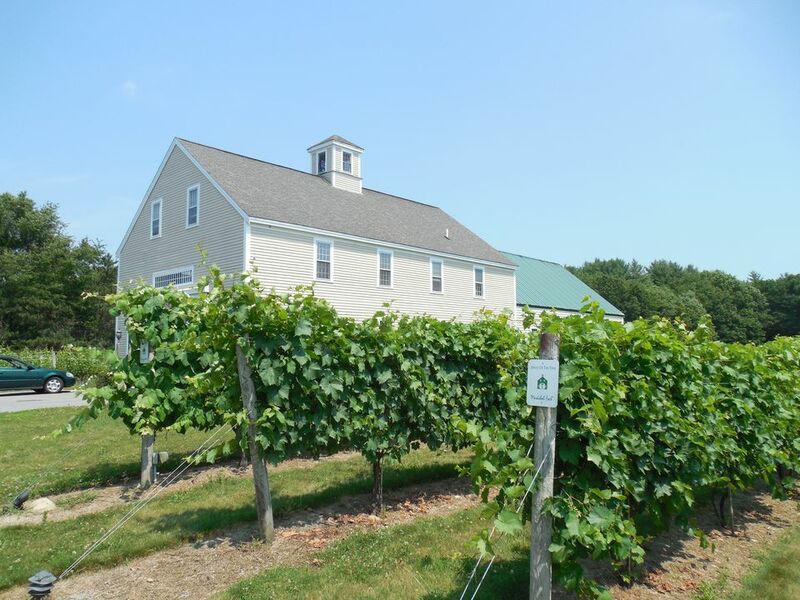 Jewell Towne Vineyards in South Hampton, NH: New Hampshire's oldest winery has won more than 150 awards for its wines. Verde Vineyards in Johnston, RI, where retired biology professor Jim Verde makes award-winning wines like St. Croix entirely with solar power. Carolyn's Sakonnet Vineyard, which is off the beaten path in Little Compton, RI, and one of the prettiest vineyards you'll encounter in New England thanks to the touch of owner Carolyn Rafaelian (founder of Alex & Ani). Shelburne Vineyard in Shelburne, VT, which is ideally situated on the shores of Lake Champlain and consistently wins awards for its cold climate wines. Keep in mind, too, that when you buy and bring home bottles of New England-made wine, you'll be able to relive your New England vacation memories at the twist of a corkscrew. Why not splurge on a case?